Three years ago my husband David and I lost our son, Oscar, very unexpectedly. He had been admitted to hospital for a short period of time to be treated for Osteomyelitis, a rare but non-fatal bone infection. The best guess as to the cause of his death, following months of investigation, is that he contracted Rota Virus during his hospital stay which, in extremely rare cases, results in Encephalitis, a viral inflammation of the brain. In Oscar’s case this resulted in his sudden death. In the weeks that followed we decided to set up a charity, determined that his name should live on and inspired to create a valuable legacy on his behalf. We wanted the remit of the charity to be as broad as possible, because we wanted the cause to be relevant to a large group of people, and we wanted to address problems which we described at the time as ‘big enough to matter but small enough to be addressed in our lifetime’. *Providing support and activities to children, their families and medical teams who strive to make their time in hospital as comfortable as possible. *Providing funding for the development of research and development into and the provision of improved diagnostic techniques and technology. *Providing increased access to relevant knowledge and data via the sharing of best practice and the application of technology. 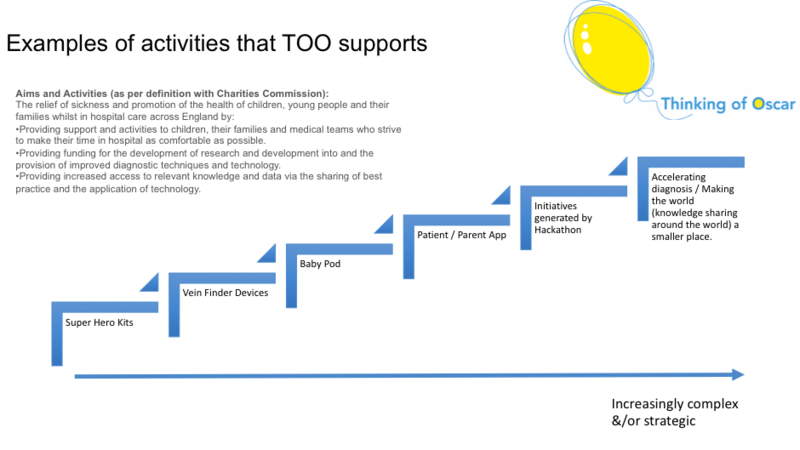 The first initiative that we funded was the placement of vein finding devices into the John Radcliffe Hospital, Oxford and Great Ormond Street Children’s Hospital, London. One of the very few stressful experiences that we had had with Oscar during his short time in hospital had been when taking blood or being cannulated. Finding suitable veins in children of that age can simply be extremely difficult and we felt that these devices would have made a huge difference. Whilst not intended to replace the professional judgement of clinicians the feedback that we have received from doctors and patients alike has been overwhelmingly positive. It was in the development of our second campaign that we hit our first major stumbling block. The aspiration had been to open a new procedures unit within the children’s hospital in Oxford. The purpose of this would have been to enable the hospital to conduct simple procedures and operations within the confines of the children’s hospital without the need to admit them to the main hospital. Benefits to children and their families would be a less stressful experience as they would find themselves in familiar, child oriented surroundings, and, in all likelihood, receive swifter treatment because they would not face the risk of being bumped from their theatre slot by a more urgent case. From the hospital’s point of view the ability to offer care more sensitively and the operational efficiency gains would have been huge. The hurdle that we ran into was that this type of change would require amendments to the PFI contract (the mechanism which is in place to fund the hospital buildings) and, with multiple stakeholders involved, the margins and expected penalty charges rendered the project unfeasible, with the projected cost to Thinking of Oscar coming in at more than 3.5 times what we were anticipating raising. Apart from not having that level of cash available, it just felt like incredibly poor value for money, and not a responsible way of us committing donations at that point in time. At such an early stage in the charity’s existence this news, which we were given around Christmas time 2016 felt like a terrible blow. We are very aware that sharing with donors progress reports on the impact that their generosity has had is critically important and so to have spent a year with a project like this in mind and then make the decision not to move forward with it could have been so damaging. We regrouped over the Christmas and New Year period and decided to approach the Trust and ask them to solicit innovative ideas from clinical professionals. We received a number of requests for funding as a result of this invitation and, with the help of our own clinical advisors and our trustees, decided to move forward with a number of these. You can find out more information about these under the campaigns section of our website but examples include the delivery of Super Hero Kits into Oxford’s John Radcliffe Children’s Hospital and Leicester Royal Infirmary in December. These kits support children who are undertaking prolonged periods of intravenous medication and seek to reposition the medicine as the child’s ‘super serum’, their super power. They also receive a super hero cape and a cuddly toy and are awarded various wrist bands / bravery bands as they under take various procedures during their stay. We are also in partnership with BabyPod and are aiming to place a number of units of their latest devices, being built by Williams Advanced Engineering, into several UK Hospitals during the course of the next 12 to 24 months. As a result of this work last year Thinking of Oscar is currently supporting a variety of initiatives which vary in levels of complexity and being tactical versus strategic. A blend of both is important to us because there is value in us being able to undertake some of the more straight forward ideas rapidly, but our real impact in the longer term will be in successfully delivering projects on the right hand side of this spectrum, which hold the possibility of altering outcomes for children and in the longer term the potential to save lives. We have learned a huge amount in these early years of the charity. Like any start up organisation we are learning rapidly, have encountered challenges, but time is our only real constraint. The most important achievement this year has been a validation of our purpose. Through participation at various events throughout the year Pediatrics 2040 in Miami, in January, delivering the key note at the Annual Conference for ASTP Proton in May, Shaping the Future of Paediatrics, an event run by the International Society for Pediatric Innovation (iSPI) in September, The Innovation Forum Leaders Conference in Oxford at the beginning of December and visits to other leading Children’s Hospitals including Alder Hey and Leicester, we are beginning to understand some of the challenges that are faced within Paediatric healthcare and the types of initiatives that are realistic to implement in order to make a positive difference. Paediatrics is an under funded segment and so innovation, whether via doing things differently or through technological advancement is critical. Networks of interested bodies who are motivated and qualified to do something about it already exist globally but they are also at an emergent stage and so it’s a good time for Thinking of Oscar to become a part of that conversation. Given our own technology backgrounds and the advent of technologies such as Artificial Intelligence, Virtual Reality and 3D printing there is real scope for Thinking of Oscar to make a difference. Hannah Cole, Co Founder, January 2018.